As expected Nifty continued on its bullish ways and encountered some profit taking on Friday.However internals look weaker. Midcaps sold off much more than Nifty which itself was supported by some select scrips. 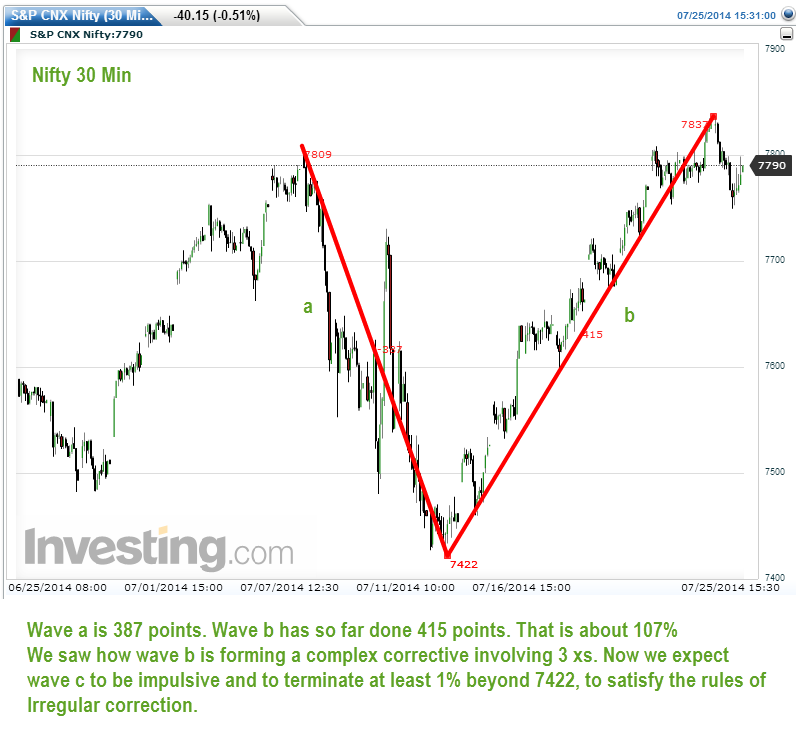 Possibility 01, suggests that the upmove with much volatility, to continue this truncated week also.There could be a gap down on Monday due to global factors, but Nifty is expected to recover some more.As per Neowave, we are in wave b of wave f, which could terminate soon, possibly on August 01.Thereafter, wave c should commence as a down move..It could gather force once it crosses 7750-7730. Another possibility is that we are in wave g of wave F which could move up some more and terminate wave F. Thereafter larger wave G should commence. 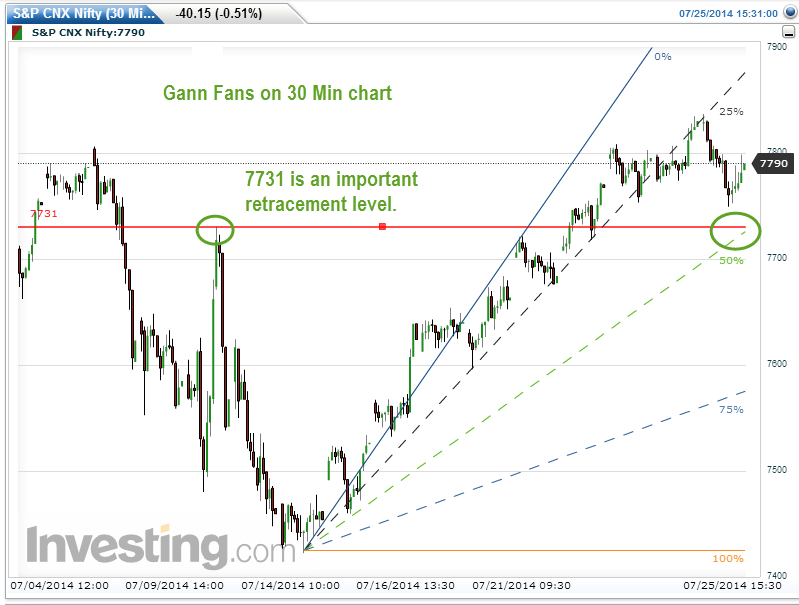 This possibility can be confirmed only when the down move crosses 7422 convincingly on the downside. These two charts above are daily charts. 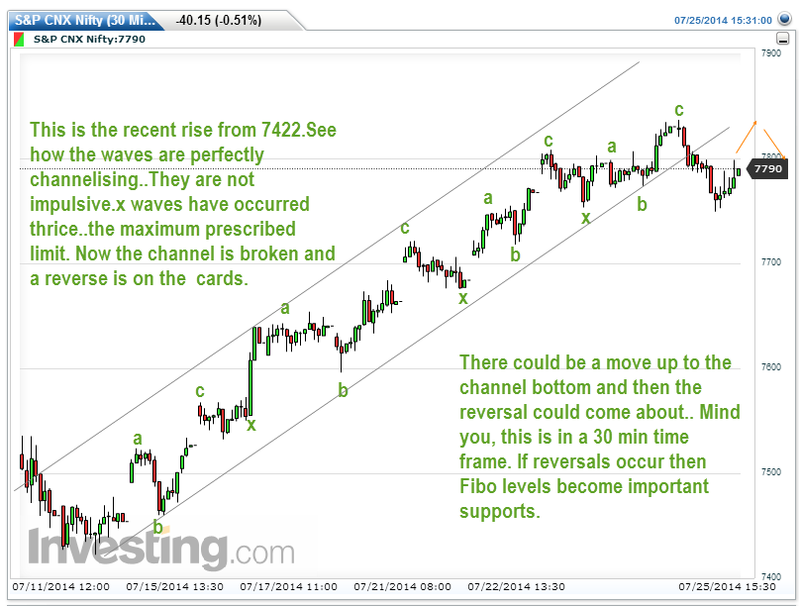 we see that wave b has enough complexity. 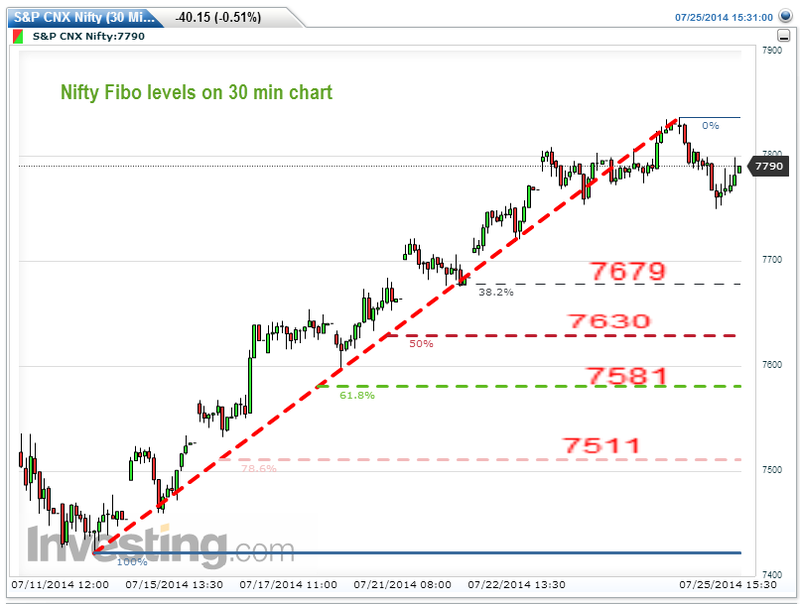 Here are the Fibo levels.. 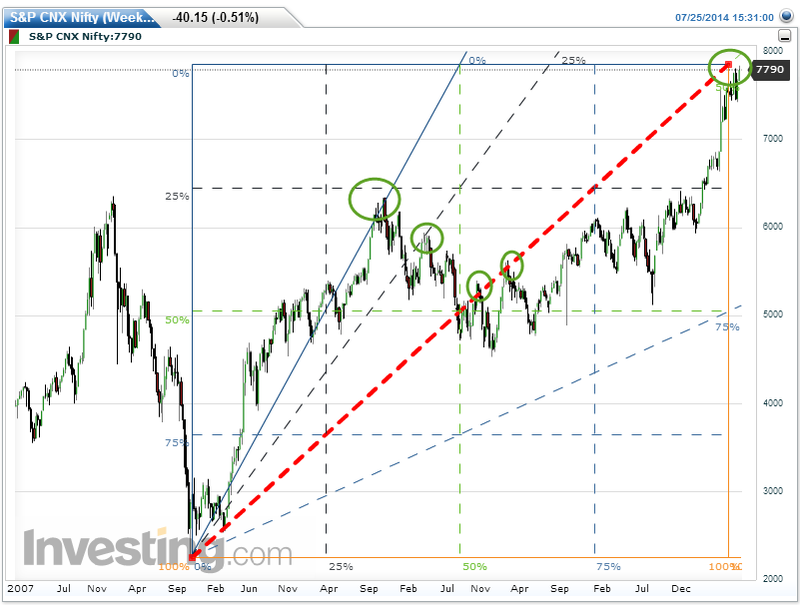 This is only after Nifty reverses decisively..
How does the weekly chart look with respect to Gann Angles? We see that the previous significant low happened when the cycles phases shortened from 20 to 9 cycles.In the expansion phase, we are in the fourth phase..which is a final phase.Normal amplitude is 13 weeks and we have already completed 12 weeks. So a significant toip seems to be round the corner..
July 25, 02.30 am, Sun is conjunct Jupiter. Which means Jupiter is conjunct. Crest should form soon. Specific date July 30- Outer date August 08 2014. July 28: Moon Apogee at 09.05 a.m.
July 29: Mercury enters Cancer at 04.31 a.m. Sun and Mercury will then be in the same sign. This means reduction in bullishness going forward in the immediate future. August 01: Venus forms a waxing square with Uranus. Trough formation within 9 days. August 01: Same day, Mars squares Jupiter. Trough formation within 10 days. August 07: Mars waning trine with Neptune reversals within 5 to 7 days. Both trough and crests possible. August 08: Sun conjuncts Mercury. On July 28th, the combust zone begins. August 08: Same day Sun and Mercury are in waxing trine to Uranus. Summation of what I expect to happen is shown in the chart below. But then Iam still evolving this indicator. So use it with caution. Anyway, no trading without stop losses or on anticipation, right? 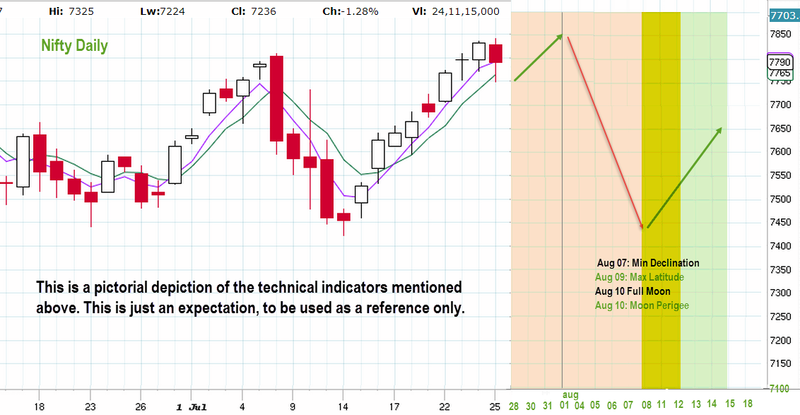 we expect Nifty to continue its up move this truncated week. 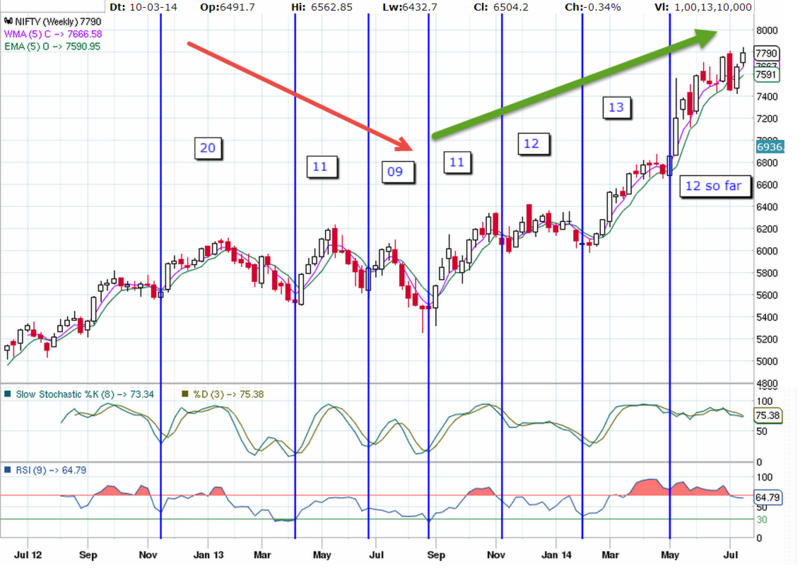 There may be a down move on Monday which can be bought into.From August 04, Nifty is expected to reverse. That could be either the final leg of wave f of F or wave g completion. If so we need to confirm if the move takes Nifty effortlessly beyond 7722.Personally I think one more upmove is pending in Nifty, the final wave g of F.
So trade carefully and enjoy the effort! Thank you for being my beloved readers..
How deep the fall can be after g of F? I expect wave G to commence then.That should be another 11 to 13 month affair and take Nifty to 6400-6500 levels.Of course with big rallies and correction.That should end the diametric correction which began in January 2008.Post this diametric I expect we will have the mother of all bull markets, truly impulsive whose first wave will top out in 2016. Vidyut these are expectations..God alone knows what Nifty will do.As she reveals her intentions little by little we will modify our Navigation!